This year marks the 30th anniversary of the Le Locle-based Christophe Claret manufacture – which produces high-end mechanical watch movements for other companies – and the 10th anniversary of Christophe Claret the watch brand. Paying homage to these impressive milestones required something equally as impressive. 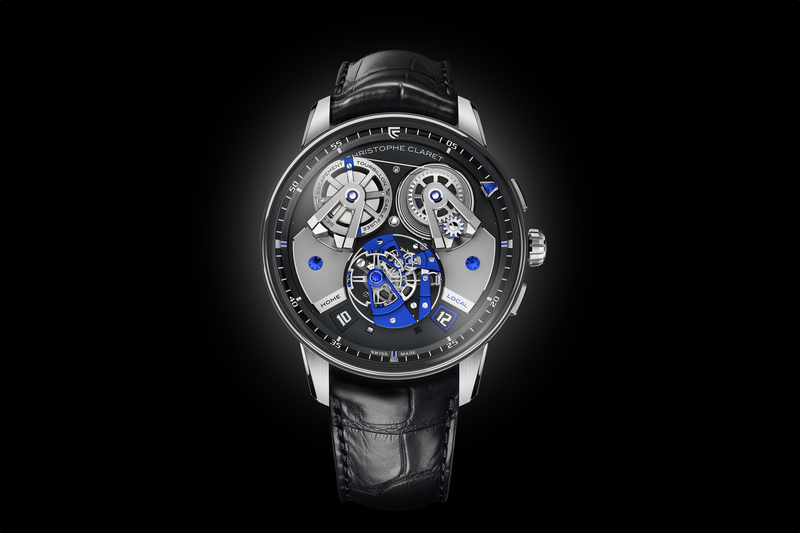 Introducing the Christophe Claret Angelico. For the first time within a wristwatch, the Angelico model combines a tourbillon with a long detent escapement and a cable-type fusee transmission system. The Angelico is driven by in-house hand-wound caliber DTC08, which measures 41.10 mm x 14.20 mm, has 62 jewels, 470 total components, and a 72-hour power reserve stored within two parallel-mounted mainspring barrels. In addition to the unprecedented combination of a tourbillon, detent escapement, and cable-type fusee, the Angelico features an instant jump dual time display with day/night indicator. Plus, there is a triangular jewel on the outer ring that circles the peripheral of the entire dial every 60-minutes, acting as the minute hand, so to speak. At the top half of the dial, you can see the cable connecting the two mainspring barrels, and on the lower half you can see mechanically powered, digitally displayed home and local time indicators, as well as the detent escapement system with visible balance wheel that oscillates 18,000 times per hour (2.5Hz). The Angelico, which measures 45.50 mm x 17.45 mm, and is 30 meters water-resistant, comes in two variations: one is 5H red gold with 4N pink gold hand and natural red ruby minute hand ($238,000 approximately) and the other in grade 5 titanium with white gold and a natural blue sapphire minute hand ($218,000 approximately). Each version is limited to 10 pieces. Learn more at Christophe Claret. As a true chronometry purist, Christophe Claret has once again taken the most complex path by choosing to equip the Angelico watch with a long detent escapement. To prevent the detent from turning over, an anti-pivot cam, integral to the sprung balance, works in conjunction with the safety finger. This fabulous mechanism, whose reliability had already been demonstrated in the Maestoso watch, is fitted for the first time in a tourbillon. To cope with the risks of over-banking, a flexible thrust bearing fitted on the wheel and connected to the balance absorbs any excess energy. Once again, the challenge is among those that only a rare few virtuoso watchmakers are capable of meeting. 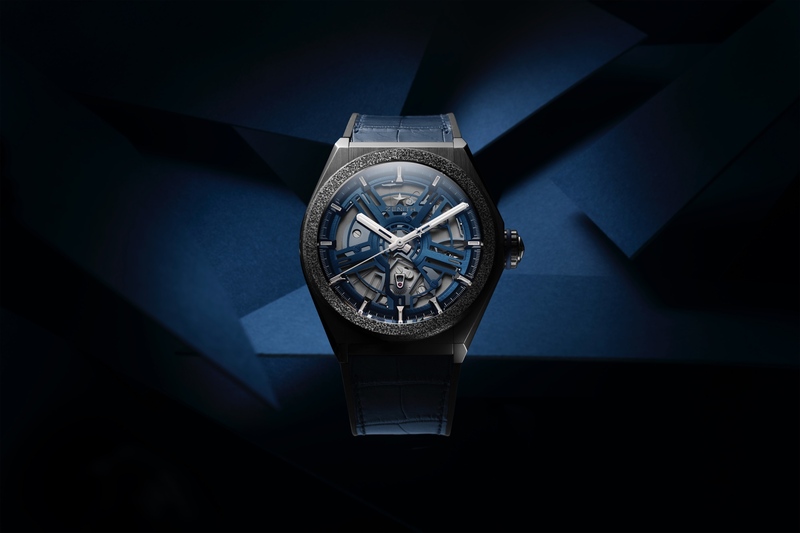 Enthroned at the heart of the Angelico watch, the tourbillon performs its stately dance involving one full turn in six minutes, in order to reduce the impact of its inertia. 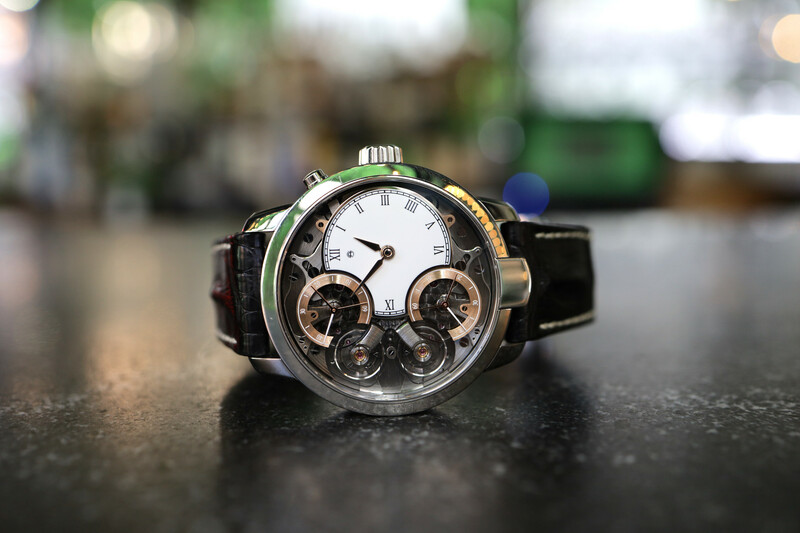 Christophe Claret has focused on two materials renowned for their lightness: the carriage is made of titanium, and the bridges from aluminum (316AL). The choice of a large 16mm cage diameter provides ample scope to admire the beauty of the detent escapement, a rare mechanical sight exercising a powerful fascination. Chronometric (precision timing) performance is an endless quest, as well as an ambition and a passion. All three of these forces drive the creation of each of the watches developed, designed and assembled since 2009 within the Manufacture Claret. In addition to the tourbillon with detent escapement unveiled at the heart of the Angelico model, it is also endowed with the constant force delivered by the cable-type fusee transmission mechanism linked to the double mainspring barrel. Traditionally equipped with a chain, this device, developed to ensure a constant supply of energy to the movement, once again demonstrates Christophe Claret’s capacity for innovation. Instead of the chain, whose design is based on the alignment of multiple links, the watchmaker has made the unprecedented choice of connecting the double mainspring barrel to the fusee via a Dyneema nanofiber cable. There are two reasons for this. The first is to optimize efficiency by eliminating all the friction between links entailed by a traditional chain; and the second is to increase and precisely regulate the power reserve: the number of times the cable is wrapped around the fusee or the barrel is double that of a system equipped with a chain. While super-thin at just 0.18 mm in diameter, meaning the equivalent of three hairs’ breadths, this cable is extremely resistant. By way of example, such a cable is strong enough to pull a weight of nearly 10 kilos. While such force is obviously not required to ensure the transmission of energy to the movement of the Angelico watch, the robustness of the cable is a real guarantee of reliability. Especially since, so as to avoid any risk of breakage, it is tied and then wrapped twice around the barrel or the fusee. Based on the self-locking principle used to ensure secure ship cargo stowage, this system guarantees perfect distribution of the force exerted on the cable. At the foot of the barrel fitted with two superimposed springs, designed to achieve optimal performance, the winding of the cable drives the 72-hour power reserve indication, while the “stop work” indication, placed on the fusee bridge, indicates the end of the barrel winding.